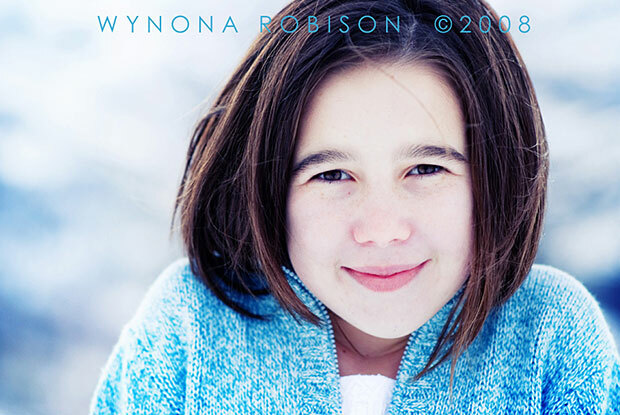 We finally got the rest of the photos from what Zoë still refers to as “THE COLDEST PHOTOSHUTE [sic] IN HISTORY.” And, just like the first batch, they came out beautifully. 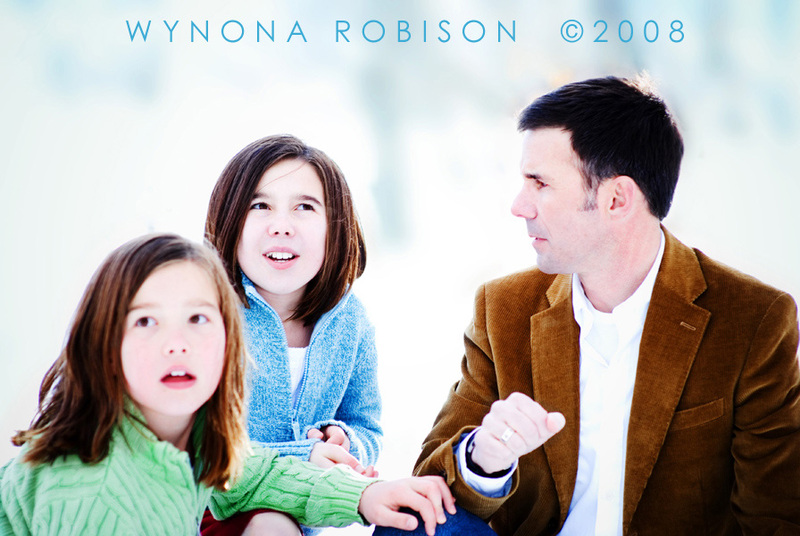 …or smirking or making some other family photo blunder. For instance, in this photo I’m either trying to explain something of great import or I’m distracted by a small shiny object just outside the frame. Who knows which? And who cares? 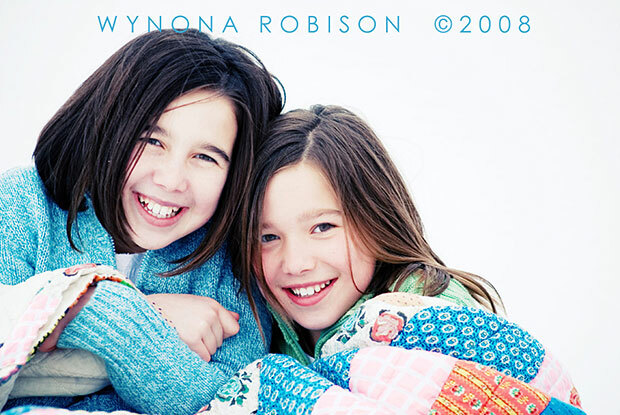 I just wanted to get some beautiful photos of my beautiful daughters, and I think I succeeded because, as of today, the girls are the first thing you see when you visit Wynona Robison Photography. 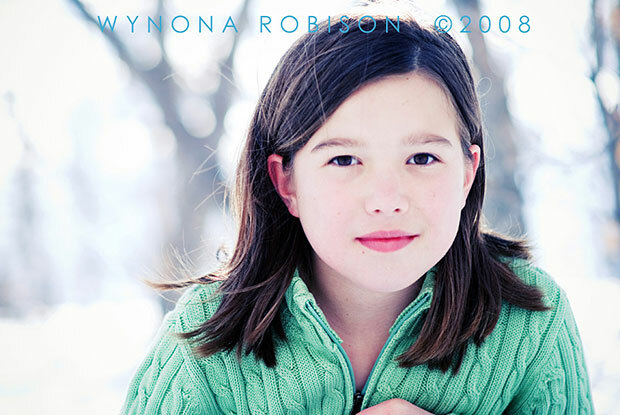 Speaking of which…I really can’t thank Nona enough. 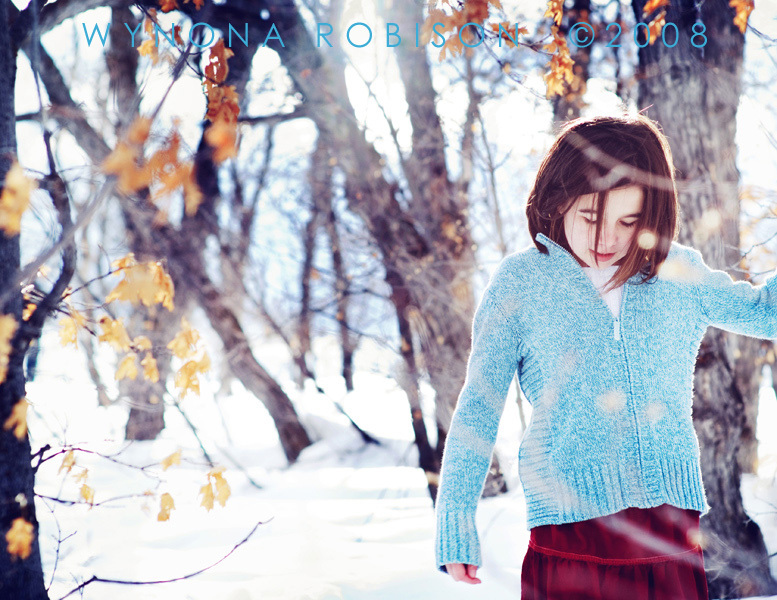 She was brilliant to work with and the results were absolutely incredible. (The Boiled Parsnip notwithstanding.) I told her that if people ever ask her for references, she can just forward them on to me and I’ll spout flowery adjectives at them for as long as they’ll stay on the phone. We knew it would be cold. We didn’t know it would be that cold. The girls were dressed in nice school clothes to start with, but I brought along multiple changes of clothes and shoes, as well as a big, warm blanket in case the girls got chilly while they were standing around. Unfortunately, when we got to our first stop, I didn’t think we’d be gone very long, so I left everything in the car as we set off on foot and started climbing. Big mistake…because when we got to the top, the location was so nice we ended up staying for quite a while and froze our tookuses (or should that be “tooki”?) off in the process. With their practical winter clothes packed snugly in the car, the girls gamely navigated the snow field in their school shoes, occasionally breaking through the frozen top layer and disappearing up to their thigh in the snow. Fortunately, Wynona‘s husband had come along as our Sherpa guide and had packed a quilt and a Thermos full of hot chocolate up the mountain. 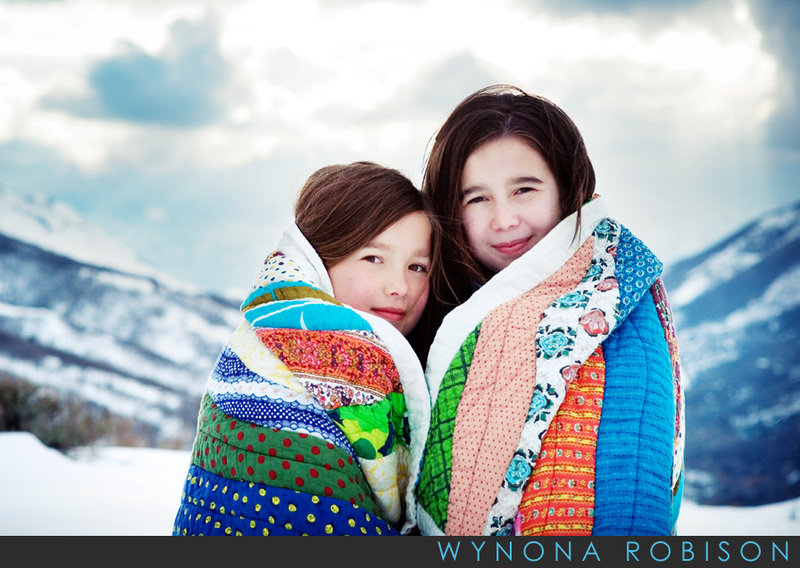 So, after a while, more out of necessity than anything else, she wrapped the girls up in the quilt and gave them some hot chocolate to try to warm them up. 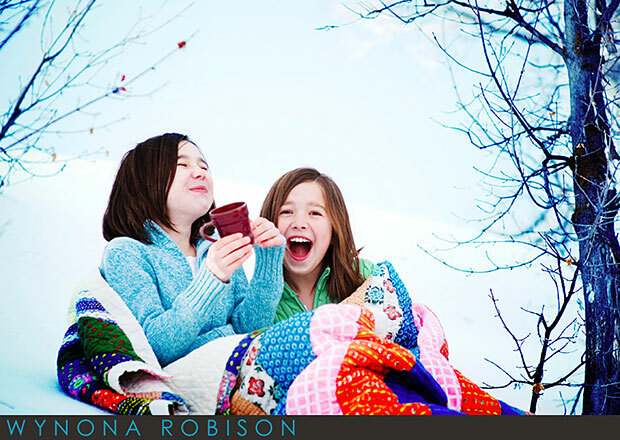 Apparently, the quilt was almost an afterthought, but it saved the day. 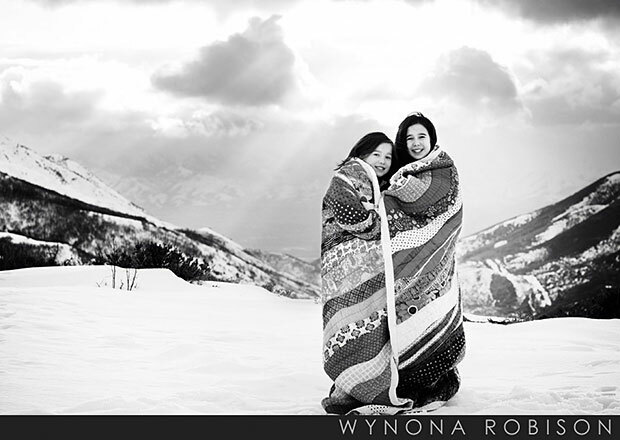 And just as we were heading back to the car, the sun broke through the clouds and Wynona asked the girls to stop one last time so she could take a few final pictures…and I am so glad she did. We were near the top of Emigration Canyon, where Brigham Young famously looked out over the Salt Lake Valley and proclaimed, “This is the right place,” but I’ll bet you even he didn’t have lighting that dramatic. Just look at those faces. Hypothermia has never looked so cute! We’re having some official “family photos” taken tomorrow. At least, that’s what I’m telling the girls. To appease the girls, I’ve agreed to sit in on a couple of the shots, but future generations will look at those photos and wonder why two beautiful young girls would want to have their picture taken while standing on either side of a giant boiled parsnip. 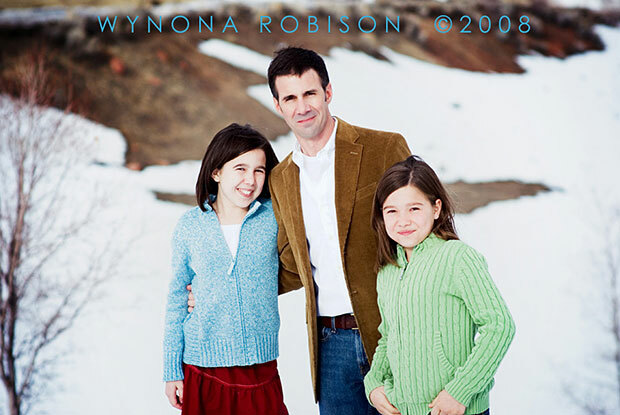 Seriously, I’ve got two highly photogenic daughters, but me? Not so much. The girls always ask why I’m not smiling in the pictures on my drivers license or employee ID badge, and they don’t seem to understand when I explain to them that if I attempt even the most simple of smiles when I have my picture taken, it always comes back looking like I’m wearing a partially-melted latex clown mask. Emma has been growing her hair out for over a year for the sole purpose of donating it to Locks of Love, a non-profit charity that provides hairpieces to kids suffering from long-term medical hair loss. Last night we had Heidi, the überstylist, lop off 10 inches for Locks of Love and style what was left. 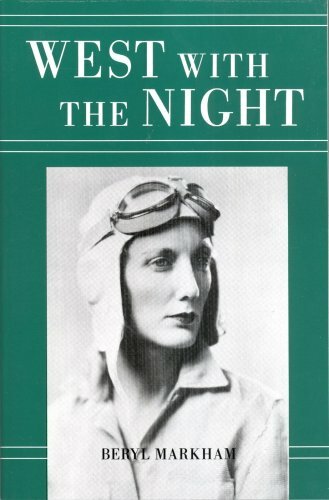 On a completely unrelated note, Beryl Markham’s West With The Night is one of my favorite books and would make a wonderful gift for any discerning bibliophile on your Christmas list. P.S. Oh, come on! I couldn’t pass up the oronym, and what other options did I have? I thought my choice, incorporating both the follicular announcement and my favorite little-known African aviatrix, was brilliant.